PTFE Teflon� yarn coated with graphite and lubricated with an inert high temperature lubricant. Hollow Core Gland Packing are specifically designed to reduce packing wear and shaft / sleeve wear in slow rotating equipments with excessive shaft run – out. Hollow Core Packing resists gland follower load and excessive run-out or whip in shaft. Gland adjustments and repacking are greatly reduces. Months of in-plant testing have proved that reinforced yarn packing with square hollow core will outlast conventional packing in application associated with excessive shaft deflection on large shaft. 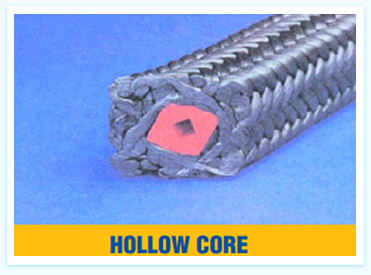 Hollow Core Packings are offered as per the suitability of the application and service.